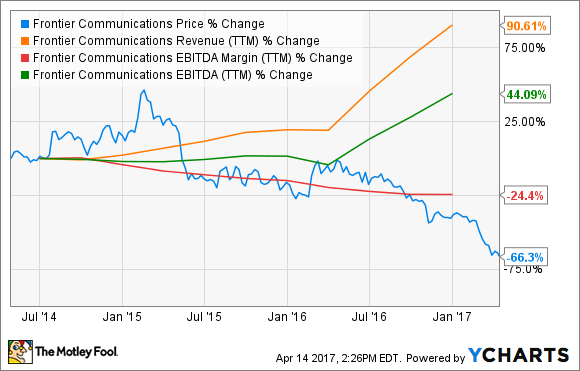 Three of these telecom stocks could make you rich. With the fourth one, you'll probably lose your shirt. Telecom stocks often present a mix of stable dividends and growth potential that's downright tempting for many investors. It's also a dynamic industry in a constant state of change. It's easy to miss some of the best investment opportunities in this sector -- or to get sucked in by some of the worst. Here, I'll show you three very different investment theses for Telefonica (NYSE:TEF), Telephone & Data Systems (NYSE:TDS), and soon-to-be telecom DISH Network (NASDAQ:DISH). And then you'll see why it's better to just stay away from the seemingly attractive Frontier Communications (NASDAQ:FTR) until further notice. At first glance, Spanish telecom giant Telefonica might not look too good. Both top-line revenues and bottom-line earnings have been falling in recent years. The stock has been dead money over the last five years and a negative three-year investment, even if you reinvested Telefonica's generous dividends along the way. But the company is setting itself up for a big bounce. Telefonica may be based in Spain, but collects 75% of its annual revenues from 20 other markets. The company focuses on high-growth opportunities in Latin America under its O2 and Moviestar brands. Only 25% of Telefonica's 276 million wireless subscribers have signed up for high-speed 4G services so far, but that's up from 12% last year and just 4% in 2015. The weak profits Telefonica reported in the last couple of years were the result of large infrastructure investments, setting the stage for exciting growth of 4G sales in Latin American markets. Investors have focused on the reported weakness, so Telefonica shares are trading at just 10.7 times trailing earnings with an effective dividend yield of 3.8% today. Those low prices won't stick around when Telefonica's international growth plans start paying dividends. TDS, the parent company of wireless service provider US Cellular, flies under the radar of many investors and analysts. It's a relatively small fish in the big American pond of wireless services, serving about 5 million subscribers in 23 states at a time when the largest providers have passed the 100-million subscriber mark. You can count the number of analyst firms that follow this stock on one hand, and still have a few fingers left over. That's a shame. We're missing out on a solid all-American growth story. The company can boast a highly targeted service and marketing strategy, focused on mostly rural areas to which the Big Four don't pay much attention. Wireless sales and profits are holding steady, while wireline broadband services provide solid sales growth. Looking ahead, management's guidance points to roughly 6% sales growth and 8% higher operating cash flows in fiscal year 2017. Meanwhile, the stock is priced for absolute disaster. TDS shares are trading below book value, and enterprise value is less than five times trailing earnings before interest, taxes, depreciation, and amortization (EBITDA) profits. That's hardly reasonable for a company posting solid cash flows and positive growth. You know Dish as the last stand-alone satellite TV broadcaster in America. The company has been preparing to enter the wireless communications market for several years, and just invested $6.2 billion to finalize those plans. The Federal Communications Commission just reported the results of a long-awaited wireless spectrum auction, where the government collected a total of $19.8 billion in license payments. The high-quality airwaves were formerly assigned to over-the-air TV signals, made redundant by the smaller bandwidth needs for the digital TV signals broadcasters use today. Dish wasn't expected to walk away with any part of this spectrum auction, but ended up the second-highest total bidder with a 31% share of the final dollar tally. Analysts don't know what to make of Dish chairman Charlie Ergen's wireless strategy. Some argue that he's simply setting the company up to be acquired by one of the larger telecoms, and others speculate that Dish could launch a ground-based video-broadcasting service built around 4G and 5G wireless network signals. This $6 billion investment fits both of those theories -- but there's more. Ergen has been very serious about joining the wireless service market. Dish considered a merger with T-Mobile USA (NASDAQ:TMUS) four years ago and spent $13 billion on spectrum licenses in the FCC's last major airwaves auction. Last week's spending spree just added more fuel to that old fire. Dish may indeed have a cell-style wireless video service in mind, and would probably pair it with a plain old data service, as well. The future of broadcasting, communications, entertainment and more will be a commodity market -- so why not own the invisible pipes that all these businesses must depend on? It's a risky move, and Dish is not guaranteed to score big wins in a brand new business territory. Nearly 11% of the stock's public float is currently sold short, analysts predict shrinking sales and earnings over the next couple of years, and the wireless auction bids will consume about two year's worth of operating cash flows. So Dish's fascinating surprises might be worth a small stake, or just some window shopping -- but don't bet the farm on this stock today. Finally, there's Frontier Communications. The regional telecom has invested in several ambitious local-market buyouts in recent years, taking over many FiOS and U-Verse installations from the two largest telecoms in America. If the idea was to benefit from economies of scale, that tactic is failing in a big way. Frontier has more than doubled its long-term debt load and annual interest payments over the last three years. Revenues surged 90% higher on these instant infusions of fresh subscriber markets, but EBITDA profits only increased by 44%. Economies of scale are supposed to boost profit margins, but Frontier's margins are moving in the opposite direction. Investors have punished this disappointing performance with 66% lower share prices. The buyout of FiOS services in California, Texas, and Florida instantly boosted Frontier's customer count by 68%. Amid technical issues with these operations, about 10% of the newly added subscribers canceled their Frontier services over the next two quarters. Don't be fooled by Frontier's massive 21% dividend yield. Frontier's management is keeping a stiff upper lip, but won't commit to any promises about the payout. "There has been no change in our policy," said CFO Dan McCarthy in February's fourth-quarter earnings call, "and [the board of directors] will just continue to evaluate that going forward." Oversized yields are usually not reliable paychecks, but red flags that are warning investors to stay away from deeply troubled business operations. This one's no different. Leave Frontier alone until it can stop losing broadband subscribers -- if that ever happens.